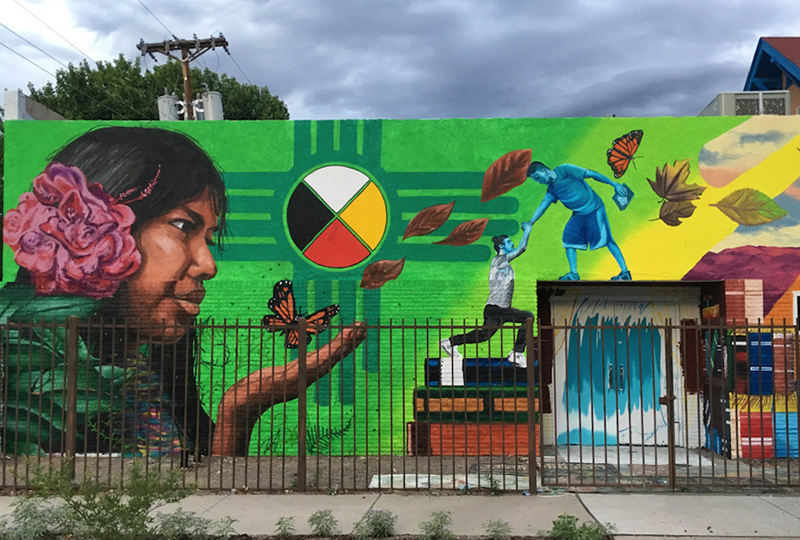 In describing this mural, Layqa Nuna Yawar says, "Educational Justice Will Guide Us Into the Future We Deserve is a mural that highlights how a just present guarantees a better and brighter future for our youth. The mural speaks of traditional forms of education given to us by nature and indigenous cultures as well as the western educational system as stepping stones to success and shows us how to make this trajectory just for all: by leveling the ground and lifting each other up within our communities as brother and sisters. Along with this message of renewal and growth, the mural reflects and celebrates Working Classroom’s mission of bridging Art, Education and Social Justice for the youth of the community." Former Working Classroom Executive Director Gabrielle Uballez adds, "This project is a reflection of Working Classroom’s commitment to creating public art that thoughtfully provokes dialogue and authentically reflects our communities. For 29 years we have provided the highest quality training to our most ambitious but underserved youth – this project is no exception. These seven student apprentices had the opportunity to impact change, to pursue professional training and receive mentorship from a seasoned and socially conscious artist such as Layqa." Layqa Nuna Yawar is a migrant Latino artist, muralist, agitator, educator and organizer born in Ecuador and based out of Newark, NJ. His large scale murals, paintings and projects question injustice, racism and xenophobia, while celebrating cross-cultural identity and migration in order to amplify the silenced narratives of people of color around the Americas and the world. Having migrated from Ecuador to the USA at an early age, his art has been greatly impacted by the immigrant experience and by his own multicultural identity. His artwork developed out of a traditional visual arts education, a practice of street art interventions and independent self-organization principles. His public art aims to reflect and amplify silenced voices by using the power of monumental art and representational painting in public space in order to create safe spaces for imagination and identity projection. By creating murals with the involvement of host communities, these landmarks can help us imagine and create a better and brighter future.